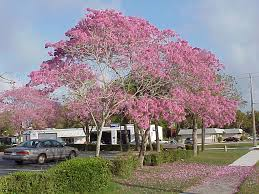 Molly Ringwald has a rival and it’s the pink trumpet tree, also known as the pink tabebuia (pronounced “tab-bee-boo-ya” or “tab-bay-boo-ee-a”), Tabebuia heterophylla, blooming now in a neighborhood near you. 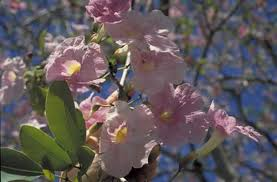 Tabebuias are native to the Caribbean and South America, and can be propagated vegetatively or via seeds. Vegetatively propogated trees flower at the same time, whereas seed-propagated trees will flower at different times. They prefer full sun, well-drained soils and are fairly drought-tolerant. 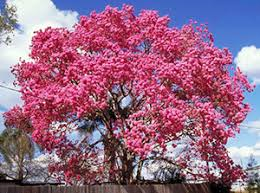 If flowering trees stop you in traffic, and you don’t mind a carpet of blooms in your garden, the pink tabebuia makes a good, medium-sized tree choice.